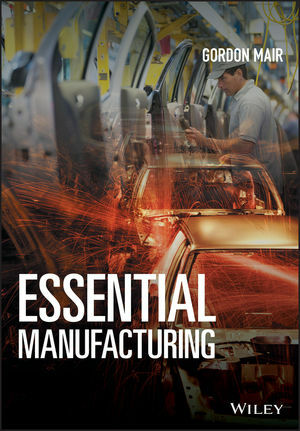 Essential Manufacturing provides a comprehensive introduction to the wide breadth of the manufacturing industry. There is a need for all engineering and business students to understand the importance and context of the manufacturing industry. An engineer should have a well rounded appreciation of all aspects of the industry they work in, including manufacturing. This is evidenced by professional bodies expecting all accredited engineering courses to provide students with a background that allows them to see their own specific discipline in context. Similarly, business students will often find themselves dealing in some way with manufactured products or even be directly involved in manufacturing operations management. This book will cover the full spectrum of the manufacturing industry to provide a holistic appreciation of the topic but with enough detail to be of practical use. The book begins with an introduction to the manufacturing industry, its history, and some important manufacturing concepts. The materials used in manufacturing and how they are produced are covered. This is followed by a more detailed description of the more common manufacturing processes, their application, and the types of automation used in the manufacturing industry. Consideration is then given to the important aspects of manufacturing operations management and production planning and control, work study, and manufacturing economics. How to maintain quality in the manufacturing process, including metrology, is examined and this is followed by human factors in manufacturing. Finally, a speculative look at the future of manufacturing is included. Suitable as an introduction for more advanced study. Satisfies the requirements of college and first and second year university engineering courses. The book provides a comprehensive, concise introduction to the manufacturing industry for engineering and management students. GORDON MAIR has carried out teaching, research, and consulting in the Department of Design, Manufacture, and Engineering Management at the University of Strathclyde for almost four decades. He is also a Chartered Engineer, Fellow of the Institution of Engineering and Technology, and Fellow of the Higher Education Academy. His teaching has covered the broad spectrum of manufacturing including its technology, management, and implications for product design. His research interests and publications are in the areas of manufacturing automation and robotics, telepresence, multisensory and multimodal displays, and all aspects of the interaction between humans, products and the environment. He has been a consultant to industry for production engineering, advanced manufacturing technology and operations management projects. He has also served as an expert to the European Commission for various multinational project assessments and reviews.